Discover a new favorite with our Mango Pork Tenderloin recipe. 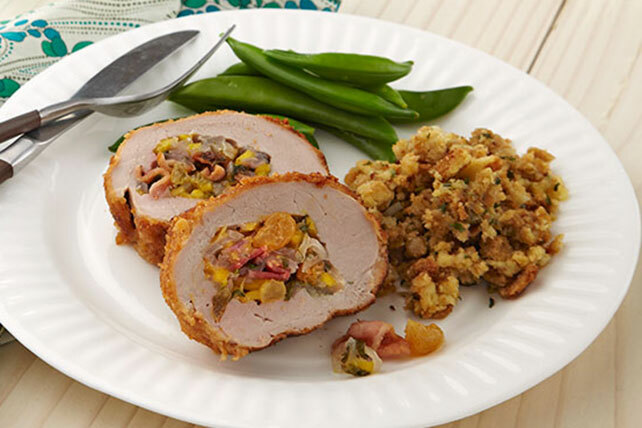 This Mango Pork Tenderloin recipe features a fresh mango and bacon stuffing. Cook and stir bacon in large skillet on medium-high heat until crisp. Remove bacon from skillet with slotted spoon; drain on paper towels. Discard all but 1 Tbsp. drippings; reserve for later use. Add onions to skillet; cook 3 min., stirring occasionally. Add garlic; cook and stir 2 min. Remove from heat; stir in bacon, mangos, cilantro and raisins. Place tenderloins, cut-sides up, on cutting board; spoon filling down centers. Roll up, starting at one long side of each; secure with wooden toothpicks. Brush with mayo; roll in cracker crumbs. Heat 1-1/2 tsp. of the reserved bacon drippings in same skillet on medium heat. Add 1 tenderloin; cook 4 min. or until evenly browned, turning occasionally. Place on rack of broiler pan. Repeat with remaining bacon drippings and tenderloin. Bake meat 30 min. or until done (145ºF). About 10 min. before meat is done, prepare stuffing as directed on package. Remove meat from oven; let stand 3 min. Remove and discard toothpicks from meat before slicing. Serve with stuffing. Ask the butcher to butterfly the pork tenderloin for you. Or, cut the tenderloin lengthwise in half, leaving about 1/2 inch intact. Cover with plastic wrap or place in a resealable plastic bag. Using a meat mallet or can, pound meat to 1/2-inch thickness. Substitute 3 cups sliced drained canned or jarred mangos for the cut-up fresh mangos.